Sols 2159-2162: Lots of Bits! Recently, we have been getting lots of extra downlink. NASA's InSight mission will land in November, and MRO will be dedicated to relaying InSight data for its prime mission. Curiosity will shift to downlinking data through NASA's Mars Atmosphere and Volatile Evolution (MAVEN) orbiter and the European Space Agency's Trace Gas Orbiter (TGO). In preparation, we have been downlinking extra data using MAVEN and TGO. This has allowed us to downlink a backlog of images. In today's plan, we were able to take some large multispectral mosaics to fill an extra ~2 gigabits of downlink we expect next week. That's an extra 4 sols worth of bits! Our activities include recharging the batteries on sol 2159. On the next three sols, Mastcam will take multispectral mosaics of "Tayvallich," "Rosie," "Rhinns of Galloway," and "Ben Haint" plus an image of "Ben Vorlich." ChemCam will analyze "Ben Vorlich" with LIBS, and ChemCam, APXS, and MAHLI will analyze "Tayvallich." It's time to check our instrument calibrations, and APXS will integrate overnight on its calibration target to better constrain dust that settled during the recent dust storm. MAHLI will image both the MAHLI and APXS calibration targets on sol 2161. ChemCam then takes its turn for characterizing dust by observing the passive spectrum of the white part of the Mastcam calibration target with a magnet under it, followed by passively observing the sky. After all of this imaging, Curiosity will drive toward our next drill location, and we hope to end within 15 m of our next drill site. 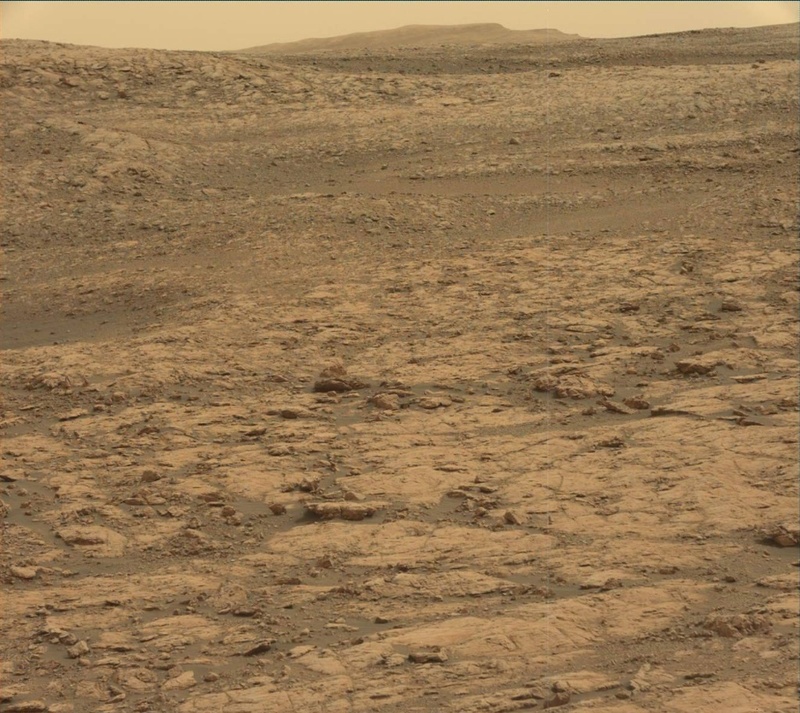 Mastcam will take multispectral images of that area to help us choose the exact spot. Sol 2162 focuses on collecting environmental data, including a sky survey and an image of the crater rim to compare dust levels in Gale Crater with those in the atmosphere as a whole. It's an extra large plan! And we will enjoy the long weekend - planning doesn't resume again until Wednesday.